With a wood burning stove from Aduro, it is easier for you to fire correctly. Our wood stoves are designed with sustainability and user friendliness in mind, and we constantly develop new products and systems that should help you get a good experience with your stove. With elegant Scandinavian design and more than 30 models that suits your home, we have made it easier for you to choose a wood burning stove. More than 300.000 stove owners throughout Europe have already chosen Aduro to warm their homes. Will you be the next? All Aduro wood burning stoves are designed with user-friendliness and the environment in mind. We constantly develop products and systems to minimize smoke from the chimney. For example, if the draft in your chimney is either too high or too low, Aduro Draftoptimizer is the solution. Aduro-tronic ensures that you get the most from the firewood, while the intelligent thermometer Aduro Smart Response makes you a true stoker. We place great emphasis on the elegant Scandinavian design, and therefore we work closely with our Danish designers Casper Storm and Torben Madsen about the design. We constantly work on developing new wood burning stoves, that cater for the consumers’ requirements in regards of design and functionality. Since the beginning, Aduro has established its name in Denmark and the rest of Europe as a supplier of quality stoves in a simple and stylish design. We do it differently than our competitors. We develop our products in Denmark in cooperation with acknowledged architects, and produce the stoves in Eastern Europe, where we produce high quality at low prices. Watch this film and get an insight into the company. 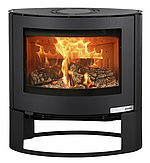 We can provide you with the whole package – from kindling and stoves to chimneys and smoke fan. We can proudly say that we make it easy to fire properly and make the most of your wood burning stove. You just have to light it up. Are you in doubt about how you light your stove properly, or do you miss good advice about the most economic and environmentally friendly fuel? Get valuable tips and tricks for lighting and firing at tips.adurofire.com.